As you all know, a couple of my blogger buddies & I started Project Pan early this year. In case you want to know what it's all about, you can catch up by reading THIS post. It's been a while & I thought I must update you all on what's been happening with the products. Before I begin, I must confess I don't have pictures for all of them. Firstly, I was traveling, along with helping my lil boy study. And secondly, it's difficult to show how much eyeliner I've used or how much mascara still remains in the tube, with pictures. So without a lot of pics to show, I'm going to keep it simple & be brutally honest to you all. Meaning, if I have not used a product or used it less, I'll update it accordingly. No fibs here...cross my heart!! 1. 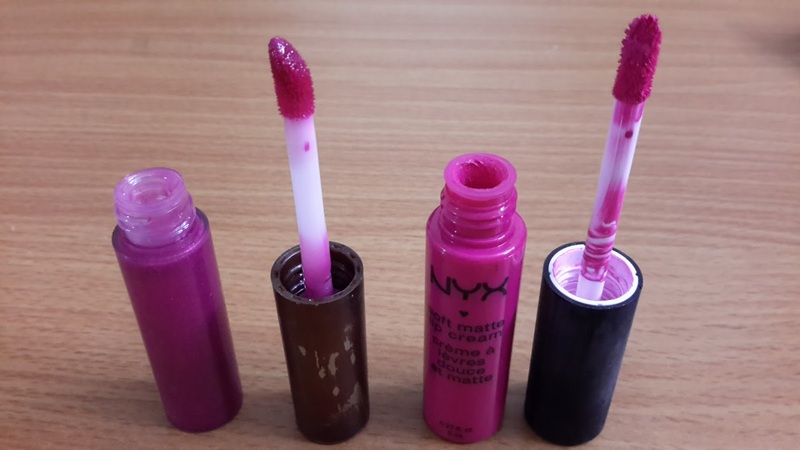 NYX Soft Matte Lip Cream in Adis Ababa - Okay, so I'm gonna be honest here & tell you, I haven't been reaching out for this one at all. I have been traveling and although I've taken this along with me, I've yet to break the hiatus I've put this beauty on :-( Sad init? Love this shade... I promise to use this more often from now on. 2‌. MAC Lip Glass (shade unknown) - Again, not reaching out for this gloss. I'm such a matte-loving Lipztickaholic that I don't see myself using this soon. Aarrghh, Neha come on.. You can do this.. Go on.. Gloss it up sometimes!!!! 3‌. 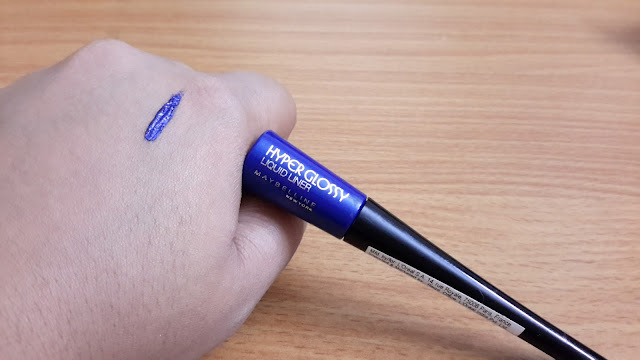 Lotus ColorKick Kajal - Good news here! I've almost finished this lil guy.. Yay for me! I've gone through so many of these that I'm getting slightly bored hehe (that's the beauty blogger in me speaking).. I think I wont be re-purchasing this one, instead I'll try out something new next time. ‌4. Maybelline Falsies Mascara (Waterproof) - I've been regularly using & loving this mascara Guys!! I've used it particularly on days when I don't wear any eye make-up. It lengthens my lashes like no one's business & looks amazing!! See HERE. Too bad I can't show you a pic of how much I've used this up ;-) Definitely a product I will re-purchase. ‌6. Sleek I-Divine Original Palette - I've been drawn to the more neutral and safe shades in THIS palette. Need to spend some time doing bold eye looks too if I want to hit pan in 2017. Phew, I know I can do this.. Buck up, buck up!! ‌7. Revlon PhotoReady BB Cream in shade Medium - Bought it, didn't like it so didn't use it enough, however I've come up with a way to finish this up. Call it a cheat if you will but I mix it up & use this with my daily BB cream hahaha!! I'm gonna use this up soon. Nothing else to say about this one, I'm still working on it ;-) Not a re-purchase for me. 8‌. Miss Claire Studio Perfect Anti-Redness Primer in 01 Clear - Yesss... I'm at it! I use it every single time, without fail, before I throw on my BB cream. It's kinda nice & I need only a very small amount. Very silicone-y texture & helps the cream glide on well. Doesn't fill in pores like the Balm Pore-fessional but definitely reduces the redness of my perpetually flushed face. Doesn't greatly help the longevity of make up. It's not a product I will re-purchase. 9‌. Loreal Face Magique Transforming Smoothing Primer - Haven't touched this one since the last post Heheh I told you, I'm gonna be brutally honest in this series. I think I'll wait until I use up a good amount of the Miss Claire Anti-Redness primer :-) But I have to tell you, this one's really nice. Lovely product..this is my 2nd tub. I'll share more in my next post. ‌10. Chanel Illuminating Powder with Shimmer - Doing my best to use this up too. It doesn't have tons of shimmer and can be used on a daily basis to perk up dull skin. That's it from me, as of now :-) Read about Project Pan updates from my friends, Pankhuri @ AddictedShades and Krupa @ IshtyleAWhile. Until the next post, Ciao!! Its sure is babe!! Heading over to see your update now.. I'm so excited we're doing this! !